The dressing for this green salad features a homemade fruit vinegar that can be made ahead. For dressing, in a screw-top jar combine oil, vinegar, shallot, wasabi or horseradish, sugar, fish sauce (if desired), sea salt, and pepper. Cover and shake well; set aside. Halve cherries, if desired; set aside 1/4 cup of the cherries. 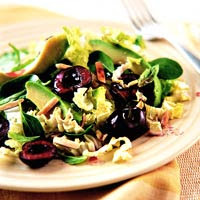 In a large salad bowl combine the greens, remaining cherries, and the avocado. Toss with dressing. Top salad with almonds, basil, and reserved 1/4 cup cherries. Mash 1/2 cup pitted sweet cherries. Place in a clean, heatproof jar. In a small stainless steel saucepan heat 3/4 cup white wine vinegar to boiling. Pour over cherries in jar. Cool slightly; cover with a nonmetallic lid. Let stand at room temperature 3 to 5 days. Strain out cherries; cover and store vinegar in a cool place up to 3 months. Makes 4 to 6 servings. Calories 392, Total Fat 31 g, Saturated Fat 4 g, Monounsaturated Fat 20 g, Cholesterol 0 mg, Sodium 181 mg, Carbohydrate 28 g, Fiber 9 g, Protein 8 g. Daily Values: Vitamin A 0%, Vitamin C 65%, Calcium 11%, Iron 18%. This entry was posted on 3:00 AM and is filed under Salad . You can follow any responses to this entry through the RSS 2.0 feed. You can leave a response, or trackback from your own site.